In today’s America, the increasing spread of fake news and socially acceptable discrimination are making independent publishing and spaces for people of color even more necessary than before. 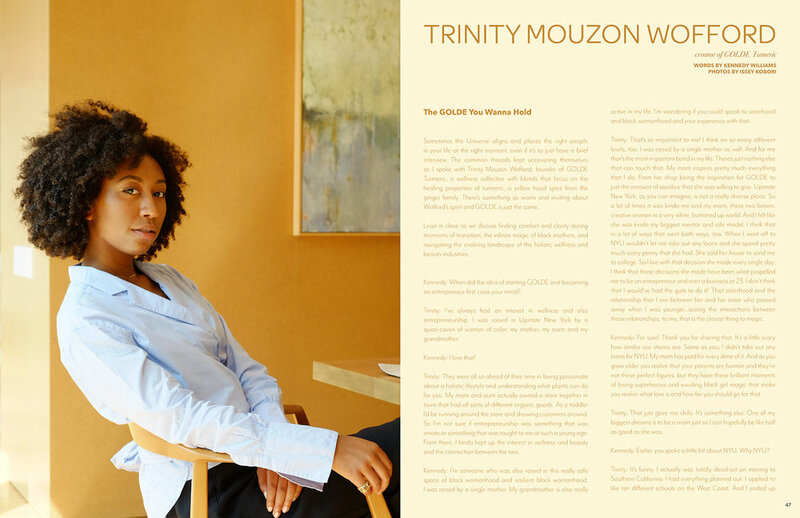 Polychrome Mag, a new magazine designed to showcase creatives of color and their work, is working to create a platform for creatives and change POC representation in the media. Polychrome is currently running a majorly successful Kickstarter campaign, which was funded in less than 48 hours, and is gearing up to release their first print issue. 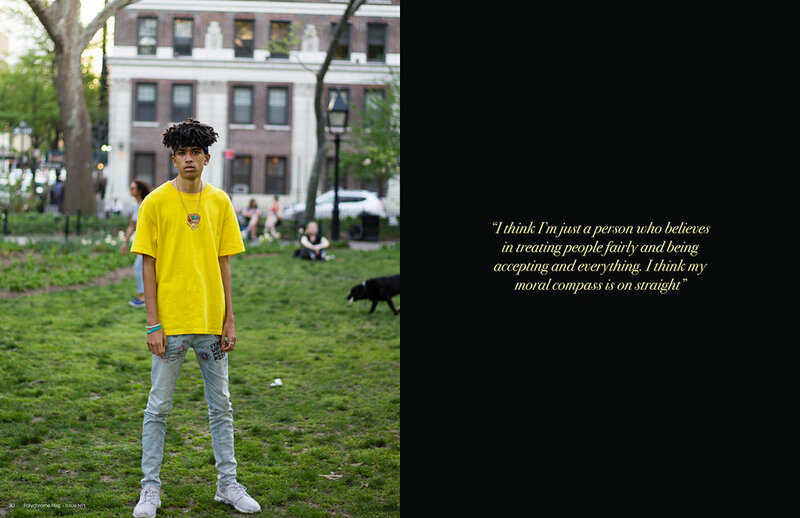 I sat down with Polychrome editor-in-chief Micah Pegues, an NYU film student and Dallas native, to talk about how the magazine started, her dream interviewees, and more. What’s the history of Polychrome? What inspired you to start the publication? I was on winter break last year during my freshman year of college at NYU. I always go to Barnes and Noble to look at new magazines, but nothing I saw really sparked my interest. I didn’t see anything I connected to, and I never really saw magazines with people of color on the covers. My dad always says not to complain about something if you don’t do anything about it, so I started thinking about founding my own magazine. I knew it was possible because my friend Gabby [Yadegari, Culture Editor] had just released a zine called Avant Girl. I knew I wanted the magazine to be colorful and multicultural. Being the college student that I am, I looked through the thesaurus for “colorful” and found “polychrome,” and I thought it was perfect name. Once I got my ideas down in my sketchbook, I registered a domain, got all the handles on social media, and we officially got started. Two weeks after I got back from holiday break, I had the first Polychrome shoot. I want to make Polychrome something that can fill the void I felt when I was originally looking for magazines, even if it’s something you casually pick up. I want it to be a space where POC can submit their work and can share it with an audience that understands them or has a similar background to them. Do you see spaces for creatives of color in your day-to-day life? What type of role do you hope polychrome will fill in communities of color, the art community, or even in the magazine publishing community? In New York, I see a lot of spaces for POC, but in Dallas, I don’t see as many – the culture there is just really different. Everyone who is on the editorial team isn’t just focused on magazine publishing. A lot of us are dealing with marginalization in other fields we’re working in. We’re now trying to broaden what we’re doing. We’re planning on making Polychrome more blog-focused in addition to the print magazine. Before, I didn’t want to make a blog because I worried no one would buy print if they can read the blog. But because we have more people who follow us on Instagram, I think now is the time to launch it so we have content that comes out more often. This way, people can engage more with Polychrome and have it be something more immediate that can foster a sense of community. What’s the focus of the magazine? What types of creatives are you hoping to feature? Are you hoping to assign themes to any issues? We don’t have a focus necessarily. It’s for any person of color who creates anything. I always say we have “creators of color” because not everyone labels themselves as artists. People who aren’t in the fine arts world don’t often identify with “artist” most of the time, so having a “creator” label is really important. We’re trying to be as open as possible, so we don’t have a strict age range either; when I’m reading a magazine, I don’t just want to read things made by other twenty-year-olds. The first issue was supposed to have a theme, but once we got started it became more apparent that we couldn’t impose a theme on the creators. We were just happy to get any submissions. We’ve already started the second issue and started lining up interviews, which is really exciting. We have people from all over the place – a prop designer, an illustrator, a blogger, a photographer. Tell me about the editorial team! I have a great team of editors who are all based in different cities. My deputy editor is Celeste Scott, who I met online years ago. We use to both make Youtube videos and that’s how we first connected. She’s always been a creative inspiration and is a gifted writer, so it’s been helpful to have her guide me through this process. My team from Dallas is comprised of Kennedy Williams, our fashion editor, and Brandon Douglas, the music editor. Brandon and I met at a STEM program during seventh grade. I asked him to be the music editor for Polychrome because he puts a lot of energy into the things he cares about, so having his thoughtful presence on polychrome is really helpfull. Gabriela Yadegari, the culture editor, and I met during the summer of my junior year in high school. We did a Tisch Summer Program together. She has lots of ideas and cares deeply about the way the world works and how everyone fits into that. Theresa Tran is our social media editor and the most recent addition to our team, and she’s made the team a family. As we’ve gotten to know each other, we’ve really built a little family. I’m thankful for all of them. The issue wouldn’t have happened without them, and I love that I can have these friends who I can build this magazine with. Tell me about your participation in Mag Mob, a collective of independently published magazines. How did Polychrome get involved, and how do you think Polychrome fits in with the other magazines? I first learned about Mag Mob through Got a Girl Crush. I found GAGC through Loveis Wise, who has illustrated for the magazine, and I later learned they’re a part of the Mag Mob. I got a message from Mindy [Abovitz, editor of Tom Tom Magazine] who invited me to a few meetings. It felt great to hear feedback from people who make magazines and hear how supportive they are of each other and of Mag Mob. The group is really impactful, and what Mag Mob is doing is really necessary right now. A lot of print magazines are dying left and right and are moving mostly online now, so it’s nice to see a group of people trying to make something physical and put their vision out in the world. The opportunities I’ve had are all in part due to Mag Mob. I couldn’t have funded the Kickstarter or planned it without them. They’re really integral to Polychrome’s development. Speaking of Kickstarter, the Polychrome campaign was funded in only two days, which is incredible! What was the process of starting your Kickstarter? What are you hoping to do with the extra funding you receive before the campaign ends? When I was originally putting together the magazine, I wasn’t planning on doing a Kickstarter and was going to just try printing a few issues. Going to the Mag Mob meeting and talking to Winter [Mendelson, Editor of Posture Magazine] and Meg [Wachter, Editor of Got a Girl Crush] changed my view on it; they both told me to do a Kickstarter and said people would support this project. In December, the magazine was almost finished, so I decided to start planning for it. I got a lot of help from Meg, and learned my options. From there, I’ve been building it up and making sure it’s something people can connect to. When I was planning this, I didn’t know if that anyone would even see it and fund it. I keep going back to check, and I can’t believe it! All the funds that we received will be used for printing. We’ve covered all printing costs for this and next issues. I’m going to send Polychrome to the printers once the Kickstarter ends, and I’ll be shipping copies from my dorm. What are some of your favorite pieces from the first issue? I love my interview with Salman Toor, a fine artist from Pakistan who lives in New York. His work is so beautiful – the relationship he has with his background and his art now is so intricate, and the details are gorgeous. I got to visit his studio when I went to shoot him for his profile last year, and seeing all his work in real life is amazing. 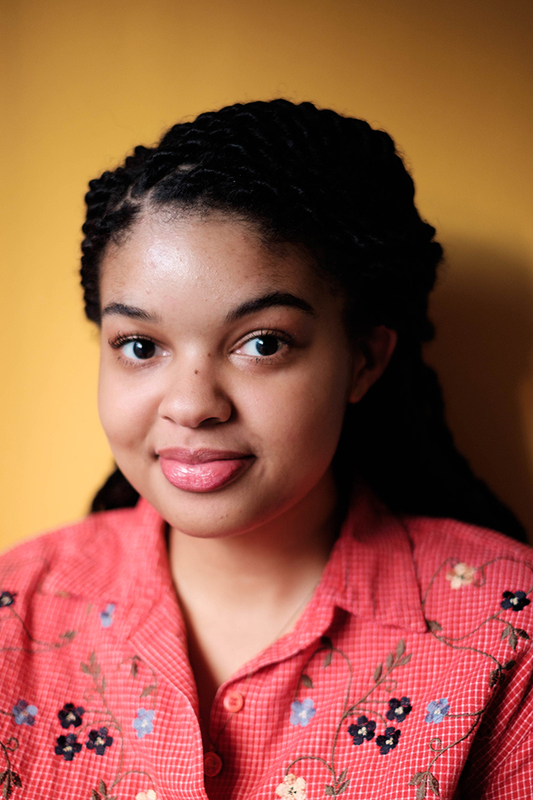 We have an interview with Lauren Ash, who is the founder of Black Girl with Om. The way she speaks about her friendships with black women, founding her own company, and manifesting her own dreams is inspiring. 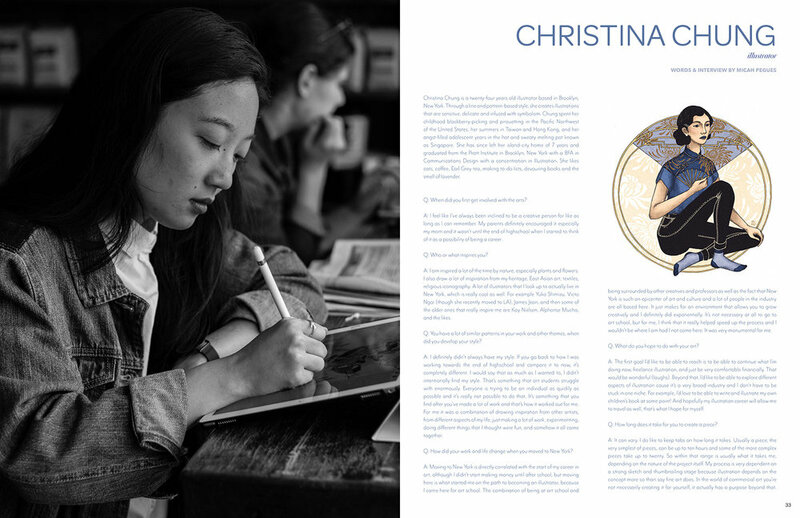 I really love the interview with Christina Chung, our go-to illustrator for the magazine (she illustrated our icons for the editor bios in the magazine!) We met last year in February, and we’ve developed a great friendship ever since. What are your goals for the magazine moving forward? Do you have any artists are your dream to interview or contribute to Polychrome? I want to have events for the magazine. It was great to see these amazing POC getting to meet and know each other better from planning the magazine. Polychrome fosters this community that can really help people make good connections and friendships down the line, so I definitely want to encourage more of that. I want to get the blog going and have posts going up weekly so we can build a more regular community. I’m not sure when I want to release the next issue, but I want to get the print issue out to more location because I didn’t plan on doing that for the first issue. Everyone has new ideas that we’re hoping to move forward with. Theresa and Celeste have been brainstorming ways to talk about mental health for POC too, so we’re hoping to build those ideas up some more! For people I want to interview, Elaine Welteroth, the former editor of Teen Vogue who just left her position there, and Amandla Stenberg, an actor and activist, come to mind. They’re two of my favorite people and such inspirations who are doing the most for POC and making amazing content. In the short history of the magazine, you’ve already faced some online hate. How do you respond to racist and offensive comments? Does that fuel your work in any way? We got a comment the other day, and it’s been the first that’s been so heinous, that’s really the only word I can think to describe it. At first, we were shocked, mostly because it was so outright mean and wrong. It was just wrong. The commenter completely misinterpreted our mission. It’s hard to confront people who don’t see value in your work or you as a person. We were trying to figure out what to do and weren’t quite sure what to say in response. I’m very privileged because I haven’t had to deal with outright racism – comments I hear are never as direct as how I’m “outdated farming equipment” like a slave as he said, or something terrible like that. In the future, I don’t think we’ll engage with these comments – this was just the first one, so we needed to confront it. Gabby responded for us all. It’s people like that who make POC feel afraid, marginalized and dehumanized, and makes it hard for a lot of our work to shine. The goal is to build an even more supportive community that’s full of love for people and the art they create so we don’t have to deal with comments like those every day. Donate now to Polychrome's Kickstarter!